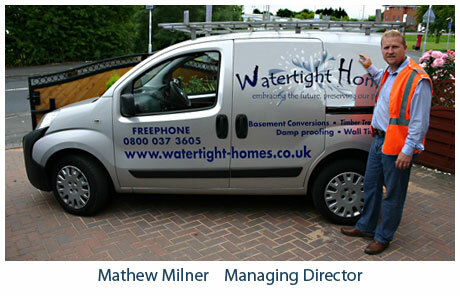 From our beginnings in 2000, Watertight Homes has grown with a deserved and constantly growing reputation. Our main aim is to deliver a high level of service to our clients. This has allowed the company to establish itself as a market leader in the area. Watertight Homes are based in Leeds, West Yorkshire and provide services for a range of client projects, big or small, including local authorities, architects, housing associations and private home owners. Our survey technicians can provide services from site inspection, report findings to estimates for any works to be carried out. Our surveyors are supported by a team of skilled operatives. We offer a complete service for all damp proofing, commercial tanking, basement conversions, timber preservation, wet and dry rot control and woodworm issues. Watertight Homes have been established since 2000, providing our clients with high quality workmanship and service. This level of service is provided from the initial enquiry through to any aftercare. All of our damp proofing work and timber treatments are carried out by skilled technicians. We will provide detailed reports on all areas and quotations and will clearly show any work that is needed. If you feel that you require damp proofing due to damp issues in a property you own or worried about woodworm infestations, please give us a call today. Our team will be more than willing to give advice and arrange a survey to be carried out. Work carried out by us is covered by a guarantee. We can also offer our clients a 10 year insurance backed bonded guarantee available by our suppliers at a small charge. Guarantees covering the damp-proofing and timber work. We are members of the Construction Guarantee protection Services. We are independently checked for quality and training standards and health and safety practice. This means you can apply for a further optional insurance backed guarantee, covering the full 10 years. This will protect you from the consequences of company failure. Your guarantee is safe even in unlikely event of Watertight Homes Ltd ceasing to trade within the next twenty years. Watertight Homes Ltd is well known for the high quality standards and the professional approach taken by our technicians. We are committed to our customers and the level of service provided is unparalleled. From start to finish, we will maintain regular contact with our clients to ensure everything runs the way it's meant to. "As a Which trusted trader, my business has been through a rigorous application process so you can be confident you are hiring a reputable trader".